Get outdoors in a performance shoe that looks as good as it feels in the women's Merrell Siren 3 Vent hiking shoe. The upper is a comprised of TPU and breathable mesh, giving you that feeling of lightweight breathability. One pull of the laces with the eyelet lacing system will provide a precise, glove like fit. The linings are treated with M Select FRESH antimicrobial agents, helping to prevent odor and footbed deterioration. Underfoot, you'll appreciate the Merrell QForm® Comfort midsole, with support and cushion built to support a women's specific stride. The Merrell air cushion heel helps add shock absorption and stability, while the 4.5mm outsole lug depth and Vibram® Megagrip® outsole deliver excellent traction on trail conditions. 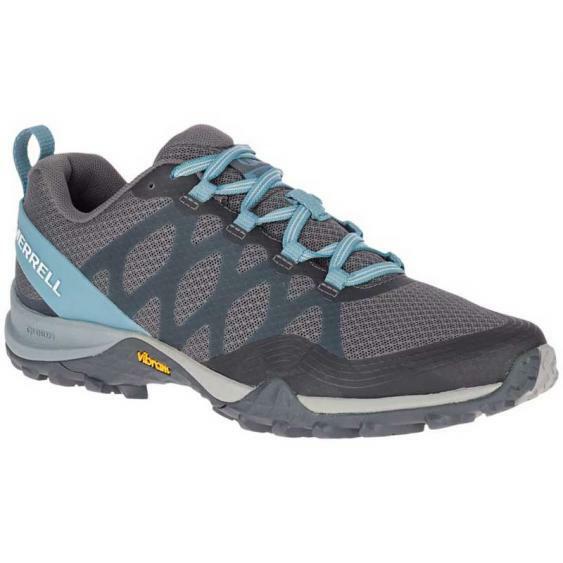 The Merrell Siren Vent is practically begging to go on adventurous hikes! What began in the Green Mountains in Vermont, now roams the world. For more than 26 years, Merrell has been providing outdoor enthusiasts with quality performance footwear. As the needs of the outdoor enthusiasts have changed, so too has Merrell's approach to addressing those needs. Over time, the concepts of "outdoor" has broadened to include all types of activities and environments - both natural and urban. Merrell is driven to keep pace with this evolution of "The New Outdoor," and continues to evolve.